In fall 2015, students launched CCycle — a campus bike-sharing program that provides affordable alternative transportation for students. In first block, 17 students paid $15 each for membership giving them access to a fleet of 10 cruisers. In Block 7, organizers offered 25 memberships for free, and within a single hour all were taken. The group aims to raise $3,000 by May 1 through Crowdfunding at Colorado College to extend the free membership program through next academic year and possibly beyond. The student-run bike share program, organized by Andrew Medema ’16, Aaron Farquhar ’18, Amelia Atencio ’18, and Jordan Ellison ’19, capitalizes on the campus cycling culture and aligns with the school’s sustainability goals. Medema, an economics and business major, says the program alleviates the “landlocked” feel of campus that can be especially hard on students new to the college. Farquhar, a geology major and environmental issues minor, has been teaching bike maintenance skills to volunteers who keep the bikes in top condition. CCycle members never have to worry about fixing a flat or lubricating a chain on the striking white cruisers, which are stationed at a designated bike rack outside the Worner Center when not in use. He says another benefit CCyle provides is to beautify campus. “I work for the bike cooperative that deals with the bike clutter on campus. A lot of incoming freshmen bring bikes with them, and they don’t ride them as much as they planned. A big part of a sharing economy is you’re reducing the amount of product, but it’s just as available to everyone out there,” Farquhar says. If funds permit, Farquhar and Medema would like to purchase one or two mountain bikes from Fuji University, which sells bikes at wholesale prices to college campuses. 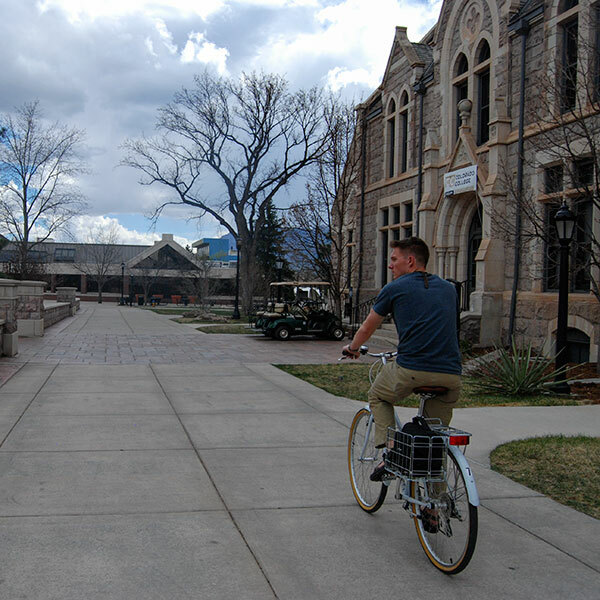 “An entry level, basic mountain bike would allow people to explore more rugged terrain around campus,” Medema says. A $15 donation will cover a block-long membership; $120 will provide a year-long membership; and $500 will fund a new bike. Learn more at the CCycle project page.